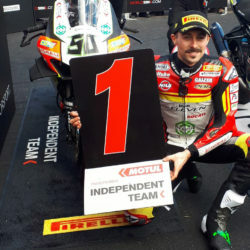 With Lorenzo Savadori joining his teammate in the pole position shootout after a superb lap of 1’41.457 on the race tyre, the team’s hopes were high of a strong qualifying. The riders delivered in style, Eugene quickly flying to the top of the pile before the field boxed for fresh qualifying tyres. 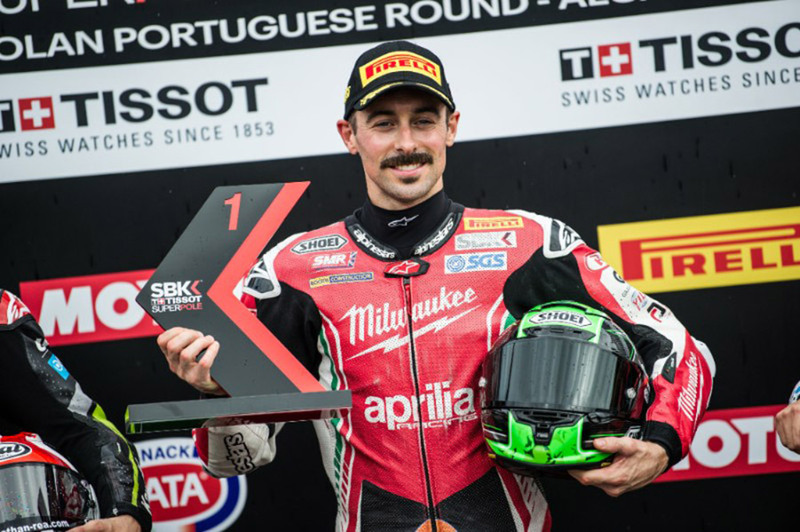 He then took a huge chunk off his best effort and eclipsed the previous pole record of 1’41.360 by -0.655s with a lap of 1’40.705, taking his first pole position in five years and the first ever pole for Milwaukee Aprilia in the Superbike World Championship. From the first and second rows the team looked set to mount a serious podium challenge with both riders. Eugene made a good getaway but Rea and Melandri behind were quicker, pushing him to P3. 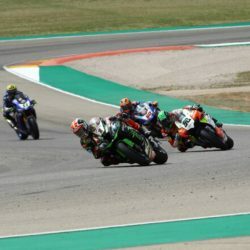 As the field concertinaed into Turn 1 Lorenzo slipped past Eugene, whose race was then cruelly ended prematurely when Fores, unable to slow his bike in time for Turn 3, slid into Eugene and took them both out of the race. 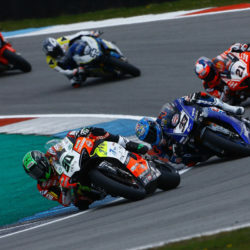 For Race 2 Eugene and Lorenzo line up P10 and P11 respectively on Row 4, under the reverse grid rules and DNFs on Saturday. With very strong pace demonstrated on Saturday however they will be a sure threat as they battle through the field targeting a podium finish. “It was incredible to do a 1’40 lap around here, I didn’t think it possible. I didn’t benefit from anyone else making a mistake or other gifts which was good, I did it by myself and just focused on the track and getting all the potential out of the bike. We really understand this bike well now and I’m looking forward to the end of season races. I felt I made a good start in the race but Johnny and Marco were really quick off the line and jumped ahead. We got bunched up at Turn 1 which let Lorenzo through and I was unfortunate to be the guy that Fores took out. I was in the wrong place at the wrong time basically.